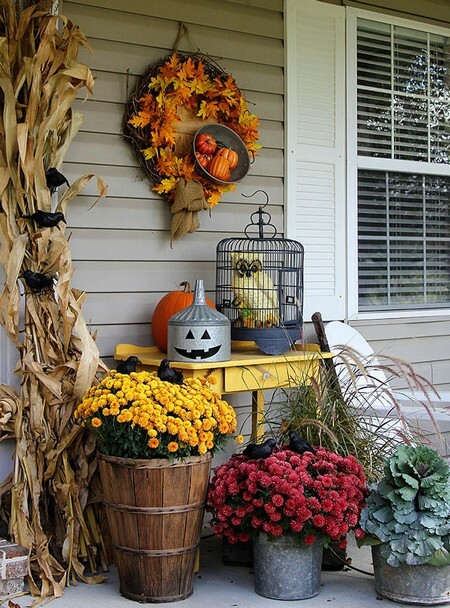 A Fall Garden Decorating For Halloween – There’s no better time to enjoy the spectacular beauty that nature has to offer than during the fall season. This is an ideal occasion for entertaining friends and family, especially around Halloween. Why not take advantage of all the vibrant colors and stimulating textures that fall provides by creating a garden themed around this exciting holiday. Halloween parties provide a great opportunity to bring the bountiful harvest from the garden indoors; or better yet, invite guests out into the garden instead. Bathe the garden or patio with soft lights. Set fall or Halloween-colored votive candles inside small jars or glasses and place them on terracotta saucers adorned with colorful leaves. These charming, little lanterns can be used as attractive centerpieces for tables or scattered throughout the garden. 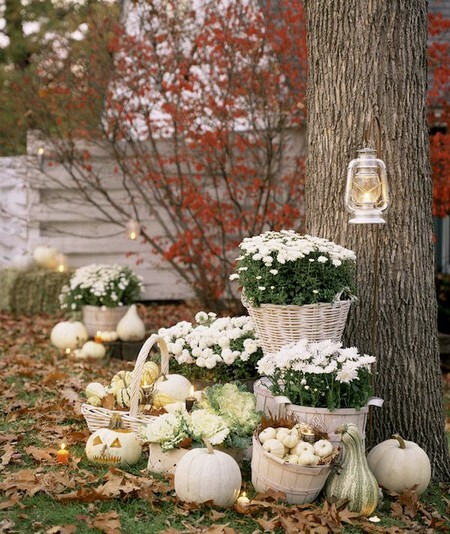 Pumpkins are an absolute must for decorating a Halloween garden. Create a variety of Jack-O’-Lanterns and spread them throughout the surrounding landscape. Light them up with candles. You could also choose to hollow out varieties of pumpkin, gourd, and even squash to use as festive containers for cut-flower arrangements. Fill them with various mums, Chinese lanterns, stems having berries attached, sunflowers, dried peppers, twigs, etc. Wicker harvest baskets also make lovely containers. 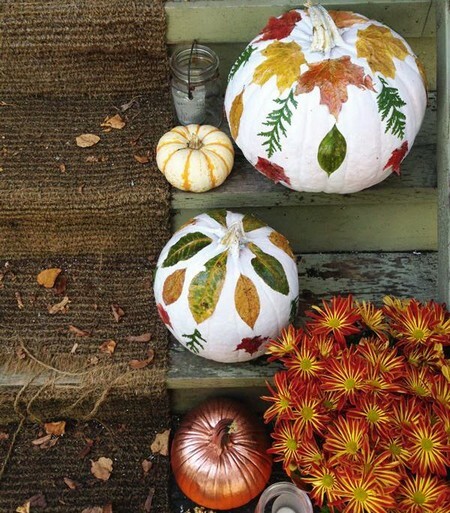 Gather a few bales of hay or straw, add some corn stalks and pumpkins, and accent with Indian corn and small decorative gourds. For additional interest, you could cover tables with old burlap sacks. Create cozy seating around these tables; or perhaps, self-contained, rock fire pits. Fall-themed gardens are generally rich with colors such as crimson, gold, dark green, and burnt orange. These beautiful colors result from a variety of flowers, foliage, berries and seed heads. 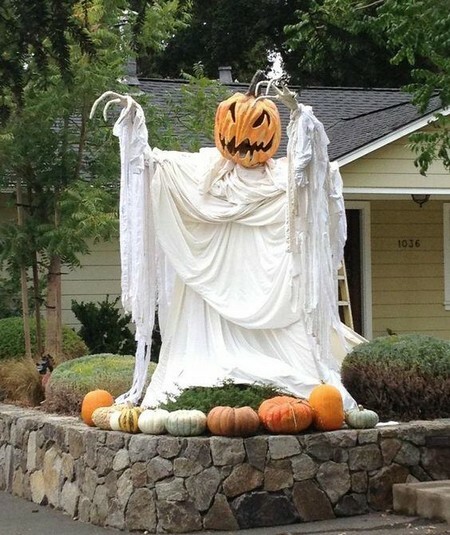 In keeping with a traditional Halloween theme, there are several ways to accomplish a spook-tacular garden. If you desire, your focus can be centered on orange and black. However, too much dark color can result in making the garden dull and unappealing. Your goal is to achieve an inviting atmosphere. Good choices for adding orange color might include zinnias, marigolds, tiger lilies, Gerber daisies, poppies, and butterfly weed. Near-black beauties could include a variety of tulips and irises. Don’t forget to throw in some orange and black-colored pansies as well. Keep in mind, however, that a Halloween theme does not need to be limited to just these colors. Flowers that are deep maroon can also help set off your Halloween effect. Look for these shades in favorite varieties of cosmos, bachelor buttons, or snapdragons. Complimentary colors such as orange mums and purple asters can add additional interest. Mix in some gray or blue grasses. Likewise, try implementing some dark maroon roses in the garden; allow them to climb along an old iron trellis. Place stone benches in various areas for seating, allowing different views, and maybe a nearby water basin to wash away troubles. 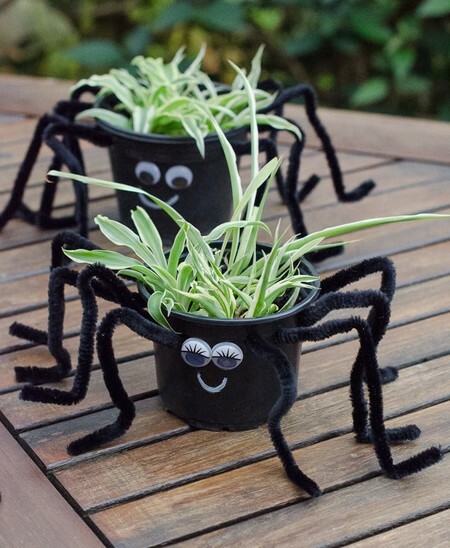 Additionally, you might want to include plants that have creepy names such as devil’s tongue, blood lily, spider orchid, bat plant, bleeding heart, bloodroot, etc. Did you know that at one time having certain plants within your garden made you guilty of being a witch? Many types of herbs, weeds, and flowers were once considered to be used solely by witches for making up magical potions and spells. Some of these included hellebores, lavender, poppies, dandelions, and even ferns. Foxglove, known also as witches thimbles, and yarrow, referred to as devil’s nettle, are also commonly grown plants in many gardens today that have a ghoulish connection with witchcraft. Just for fun you might consider designing a witch’s garden filled with various herbs. These gardens are generally circular in shape as it was once believed a sacred symbol by witches. Plant rows of red beauties around the perimeter of the garden. Red blooms were said to keep out evil doers. Try geraniums, zinnias, nasturtiums, red spider lilies, or firecracker flowers. 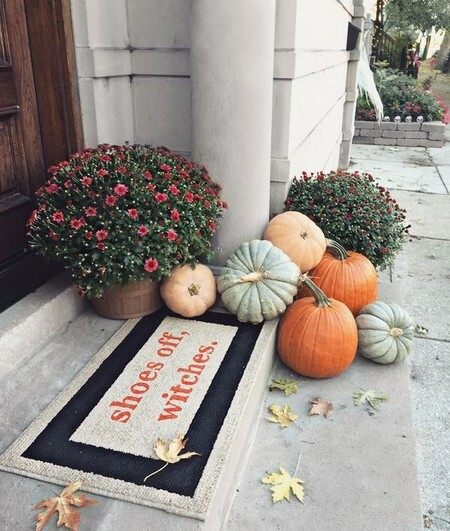 On the other hand, if you’re wishing to ward off a witch, try a border filled with vibrant yellows and rich greens. There are many varieties of flowers such as marigolds, sunflowers, green zinnias, etc. and foliage plants such as hostas, ornamental grasses, or evergreens that will achieve this effect easily. Within the witch’s garden you may find an array of native plants. Add further interest and drama by incorporating ornamental plants as well. Enhance your theme with various features such as gargoyles, toadstool ornaments, broomsticks, and small cauldrons. Allow these objects to crawl out from beneath or behind plants to create an air of mystery. 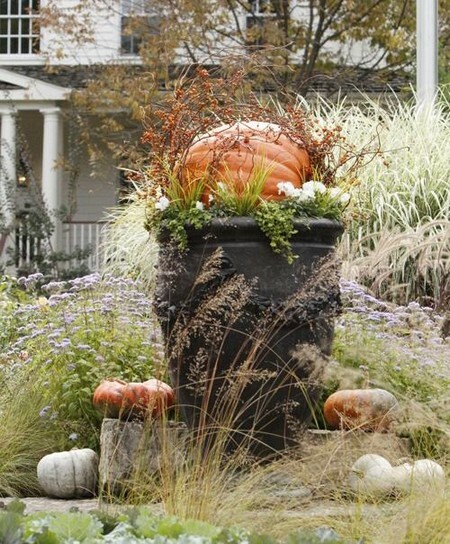 A fall garden can easily be designed to fit a Halloween theme. 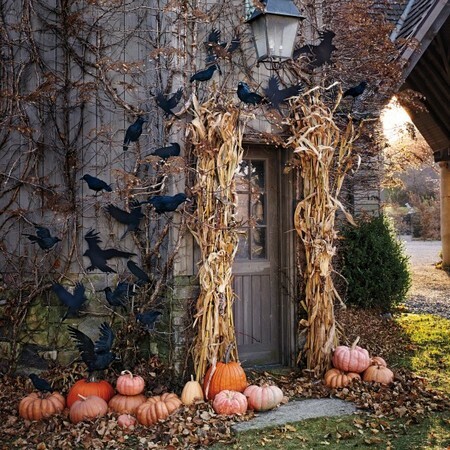 With only a dash of imagination and a few Halloween-related props, you can create an autumn garden that will amaze your family, friends, and neighbors. Happy Halloween!